Diabetic Coma is a condition caused by extremely high blood sugar levels and low insulin production. 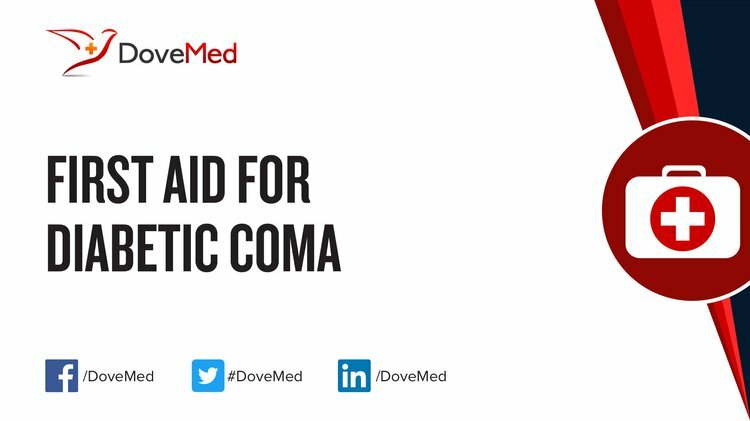 All incidents of Diabetic Coma should be evaluated by a trained medical professional, as soon as possible! DO NOT wait! Failure to obtain evaluation as soon as possible may result in serious injury or death. Call 911 (or your local emergency number) immediately, if you undergo a Diabetic Coma. What are the Signs and Symptoms of Diabetic Coma? How is First Aid administered for Diabetic Coma? The first responders (healthcare personnel) may administer 1 mg of glucagon, in case of hypoglycemia (or low blood sugar levels). Who should administer First Aid for Diabetic Coma? What is the Prognosis of Diabetic Coma? In case of delayed treatment, there is a risk for permanent brain injury due to loss of oxygen supply to the brain. How can Diabetic Coma be Prevented? Call 911 (or your local emergency number) for emergency assistance, immediately. Obiako, O. R., Oparah, S., & Ogunniyi, A. (2011). Causes of medical coma in adult patients at the university college hospital, ibadan Nigeria. The Nigerian postgraduate medical journal, 18(1), 1-7. Rosenbloom, A. L. (2010). Hyperglycemic hyperosmolar state: an emerging pediatric problem. The Journal of pediatrics, 156(2), 180-184. Ahuja, N., Palanichamy, N., Mackin, P., & Lloyd, A. J. (2010). Olanzapine-induced hyperglycaemic coma and neuroleptic malignant syndrome: case report and review of literature. Journal of Psychopharmacology, 24(1), 125-130. Barski, L., Kezerle, L., Zeller, L., Zektser, M., & Jotkowitz, A. (2013). New approaches to the use of insulin in patients with diabetic ketoacidosis. European journal of internal medicine, 24(3), 213-216. Sharma, R., Yasir, M., & Gupta, A. (2010). Formulation and Evaluation of Fast Disintegrating Sublingual Tablets of Glipizide: An Attempt to Treat Diabetic Coma. ITS College of Pharmacy, Muradnagar, Ghaziabad, UP, 201204. Yilmaz, T., Cordero‐Coma, M., Gallagher, M. J., & Teasley, L. A. (2011). Systematic review of intravitreal bevacizumab injection for treatment of primary diabetic macular oedema. Acta ophthalmologica, 89(8), 709-717. Zhou, C., Gilbert, J. D., & Byard, R. W. (2010). Early diagnosis of Armanni–Ebstein phenomenon at autopsy. Forensic science, medicine, and pathology, 6(2), 133-134. Zhou, C., & Byard, R. W. (2012). Basal renal tubular epithelial cell vacuolization and alcoholic ketoacidosis. Journal of forensic sciences, 57(1), 126-128.